This photo series was made on July 2, 2013 shortly after 2 PM. The location was in my Toyota in front of my house in Bethesda, MD. The "Take It!" Was the satisfaction of a "Eureka" moment after pondering the question of what to do with sunglasses that are kept in the car. I am the type that buys sunglasses that I fit over my regular glasses because the car windows cancel out the shading that happens in them when I am outside of the car and in the sun. There are prescription sunglasses that one can buy, that will over ride this cancellation - but they are very expensive. So, I, like many other people buy inexpensive sunglasses that are large enough (without looking too clutzy) that will fit over my regular glasses, and keep them in the car. In the course of time - these glasses get either lost or scratched as they ride in the glove compartment along with all the other stuff that I have in there. It does not take very many scratches to get irked, and a new pair purchased. This little game has been going on for years with me. One day, I decided, that enough was enough. What I needed was an answer to this, and the sooner the better. 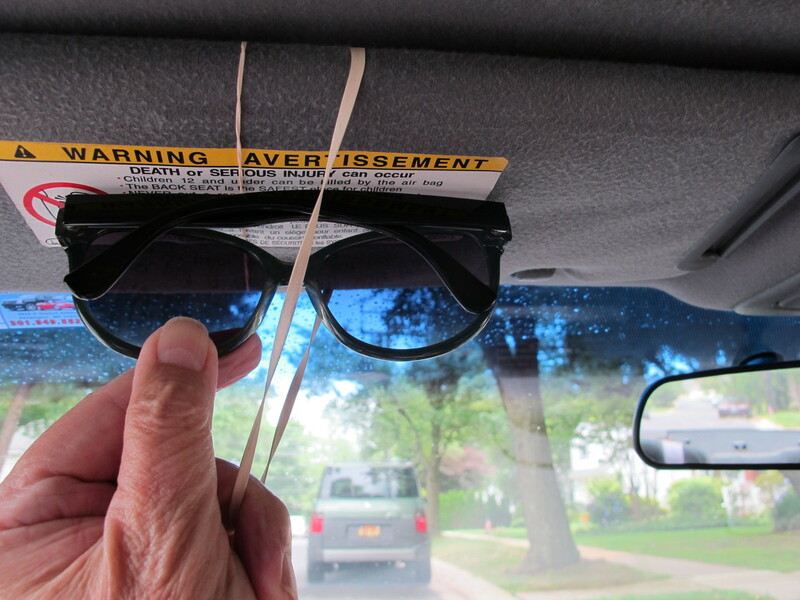 I had just returned to my house and was about to put my sunglasses into the glove compartment - when it struck me to try using a rubber band around the sun visor as a holder. The big question was quickly answered in that when the glasses were in place held by the rubber band, that they would not hang down far enough to interfere with driving when the visor was up on cloudy days, or at night. As you can see - one needs to use a fairly broad rubber band - for a little one will just not have the strength to hold the glasses up tight against the surface of the visor (The skinny rubber band that I used first, is in the photo, as an example of, what not to use). The After Take: I have had so much fun in talking with people about the problem - and found it to be more common than I had expected. I held off showing the photo in the camera monitor until I had verbally, fully gone through the problem. I then showed the photo - that is wonderfully self explanatory. The follow up looks that I get are just great. I quickly say that I had been dealing with it for many years and was just grateful that this simple answer that everyone can use arrived when it did. I also tell them, that this answer was a gift that I am ever so happy to be able to share. The label for this photo, has several avenues. The first being that I would have liked to have had this answer a long time ago - and thus "make it snappy" would have been an appropriate prompt had I needed to be responsive to that sort of request. This was one of those "In due time" answers, that no one can rush. The other part of the label comes from how one places the glasses into position by pulling down the rubber band, then once the glasses are in the right location - letting go of the rubber band and hearing the resulting "snap!" as it contracts and settles into place. Now, that sound, is satisfaction - lol. Here is hoping this will add a little "snap!" into your life and perhaps even solve a problem that you and I have been dealing with for more years than we want to admit - lol. I read this earlier at work, went home and just did the same thing. That is a great idea..
Hehe, simple answers are out there to everything. 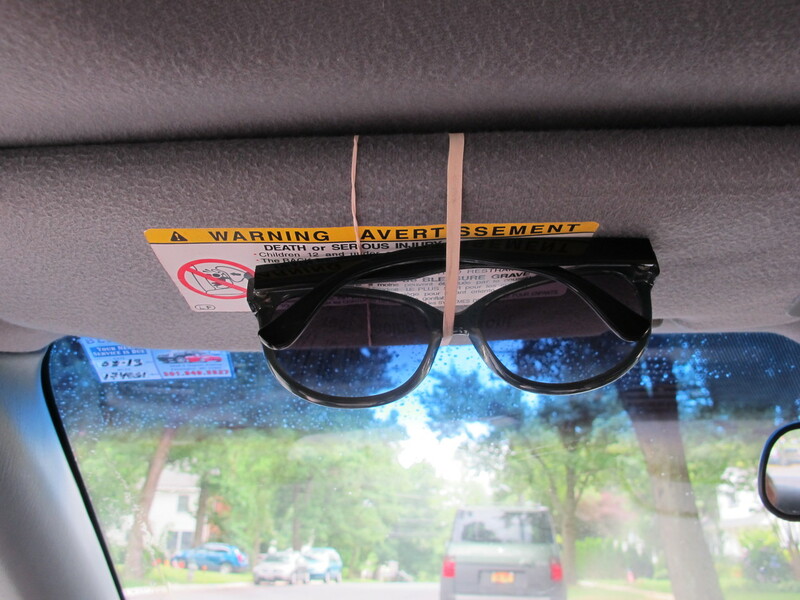 Cool improv, one cool thing about my car is the fact that is has a spot specifically designed for glasses. sigh.....i need a new car. I got a kick out of this. Cracked me up!